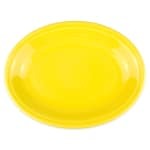 This Homer Laughlin 457320 platter features a rich Sunflower finish. This oval platter is a part of the Fiesta® series, which is popular with generations of collectors for its varied bright-hued glazes that make the dishware great as statement pieces. Beyond its popularity with hobbyists, these pieces are made of durable china and fully vitrified, so they’re great for use in commercial settings. The depth and length of this Homer Laughlin 457320 platter make it functional for many different restaurant settings, and it is microwave, oven, and dishwasher safe.